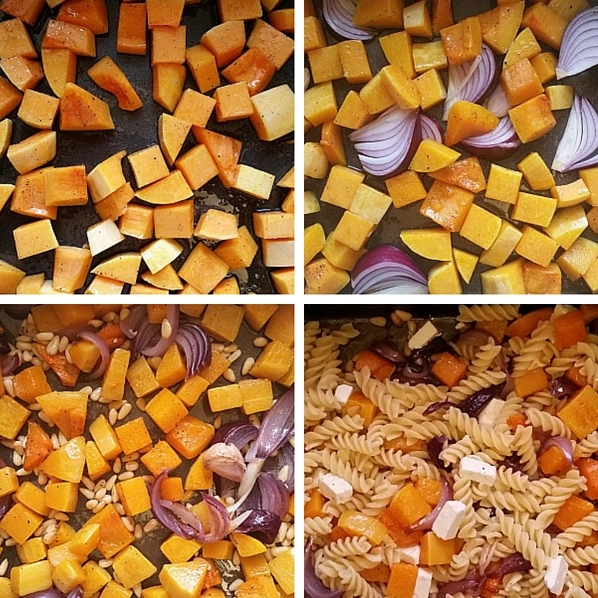 I don’t know where this roasted butternut squash pasta recipe originated from. I was fairly sure it was an early Jamie Oliver one but I can’t find it in any of his books so maybe not. Anyway, I’ve been cooking it for about 15 years so I’m sure it’s evolved from the original recipe over that time. I’m a big fan of roasting cubed butternut squash. Even if I don’t need the whole squash I usually roast it all because the cooked cubes keep in the fridge for a couple of days and you can use them in all sorts of ways: They’re good added to soups or stews; you could put them in a quiche or a frittata; I’ve added them to a salad and used them in fillings for burritos, tacos, tostadas, etc. They’re very versatile and add a rich, sweet hit to dishes. I’ve followed recipes that tell you to roast the butternut squash with finely chopped garlic but I find that the garlic can burn and go bitter if you do this. Instead I throw in a few whole cloves that I’ve squashed a bit to break the skin. 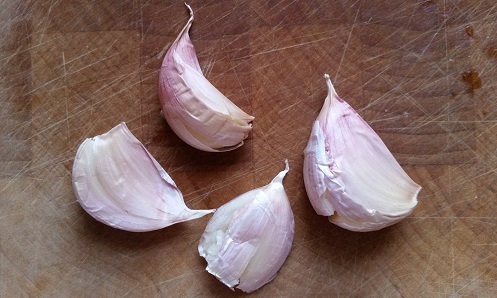 They impart a good hint of garlic and you can always squeeze the roasted garlic out of the skins afterwards if you want. It’s addictively sweet and tasty! Treat this recipe as a template and vary the ingredients to create your own dishes. I’ve definitely had this with roasted beetroot instead of butternut squash (in fact that might have been the original recipe) and that works really well. You could also switch the feta for goat’s cheese and I think black olives would be a good addition. If you switch things up, let me know how it goes in the comments below. Heat the oven to 200°C/gas mark 6. To prepare the red onion, peel it but leave the root intact and cut it into segments. Leaving the root holds the pieces together better. Leave the skin on the garlic cloves but place a knife flat on them and push down to squash them a bit and split the skin. Roast the butternut squash for 10 minutes then add the red onion and squashed garlic. Stir and return to the oven. Roast for a further 15 minutes then stir in the pine nuts. Roast for a further 10 minutes. In the meantime cook the pasta as directed on the packet. 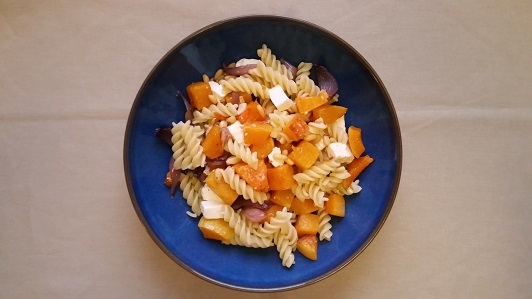 Drain the pasta and mix it with the roasted vegetables and the feta cheese. I find it easiest to mix everything together in the roasting tin. Perfect who has extra roasted butternut squash…and wontons in the old freezer. I did!! Going into lab, aka kitchen!